Marco Rubio has recently been taking a lot of heat for his robot-like performance at the most recent Republican national debate. In case you somehow missed it, he repeated a stump line verbatim four times, completely out of context, in answering the moderator's questions. Governor Chris Christie lambasted him on national television, calling Rubio out for being the robotic politician that Washington manufactures. My initial thought, besides the feeling of embarrassment for him, was: How can he not know what he is doing? Why can't he stop himself from regurgitating the same canned line? Basically, your brain takes a shortcut and tells your mouth to spew the first thing that comes to mind; that is, the idea that is currently most available in your brain. While this heuristic typically serves your brain beneficially in most every day cases - who would enjoy conversing with someone who had to put 10 minutes of thought into each carefully chosen sentence? - it has a tendency to choke under pressure. Put yourself in Rubio's shoes - or even Rick Perry, who infamously forgot the third government agency he would drop in order to cut federal spending at a debate during his 2012 presidential campaign. Or, think of when your boss walks in unexpectedly and peppers you with questions on progress or schedule or budget - items that maybe you hadn't thought about yet today as your mind was focused on resolving a more technical issue currently at hand. You freeze and spout out the first thing that somewhat coherently makes sense, even if it isn't 100% accurate. You may even repeat yourself a couple of times, using your line as filler material in hopes that a more lucid thought will quickly materialize. Daniel Kahneman and Amos Tversky discuss this phenomena at depth and provide examples of the biases created from availability in their classic 1974 paper, "Judgment Under Uncertainty: Heuristics and Biases" (pdf. version of original article here). One such analogy illustrates how the risks of an expedition may be significantly overvalued if those risks are vivid and come to mind easily. How many people do you know who are afraid to swim in the ocean because of the possibility of a shark attack - which, based on historical evidence, is highly unlikely to occur? For whatever reason - be it Hollywood movies or the gruesome picture we imagine in our heads - the image is vivid and easily recallable, forcing us to put much more weight on the likelihood that it will occur than it actually deserves. And it's not just in what we say and how we react to social situations. It is also in our private actions and decisions. Take your finances, for example. Say you began to invest in 2006 or so and, since then, you casually follow the overall stock market. You take a diversified, conservative investing approach - maybe a few blue chips, but mostly Vanguard funds, as your financial advisor recommends. 2008 comes along and wipes out 40% or more of your holdings. You panic, sell out, and lick your wounds. The market continues to drop and even though you know the market has historically produced positive returns since its inception, you stay on the sidelines, missing out on the eventual massive recovery. Why? Because the only thought, the available thought, in your mind is the vivid memory of your losses. You don't care what the experts say, you're not screwing around with stocks ever again. The availability heuristic messes with our rational thought. 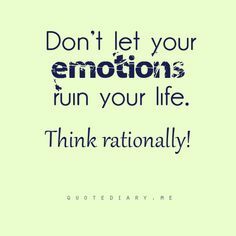 Economists like to believe that humans are rational thinkers, but rational thinking is not innate. Everyone knew the 2008 market was going to correct - and correct it did! Those on the sidelines missed out on enormous gains. The rational move would have been to dig deep and invest more. A killing would've been had. But our mind isn't innately wired to think like that - but we can train it to. The great algorithm to remember in dealing with this tendency is simple: An idea or a feat is not worth more merely because it is easily available to you. If we force ourselves to undervalue the first idea that pops into our minds, we can enable ourselves to make more rational decisions. The overwhelming affect of the 2008 crash left vivid memories in investors' brains and overshadowed the last 100 years of positive performance. Similar reactions took place in those who lived through the 1930's Great Depression. Story after story can be found of gun shy businessmen, bankers, and investors. Families put their money under their mattresses or in safes where it could never again be lost in the financial markets. We need to get beyond that train of thought and force rationality into our minds. An even more interesting strategy is to force yourself to think rationally when you have time to do so. Read the thoughts of good decision makers. Read Warren Buffett's letters to his shareholders to get a sense of how he reaches rational business decisions. They are intriguing and can be applied to personal finance as well as large scale investment decisions. Read Benjamin Graham to understand how to rationally value a business or Kahneman to understand the biases your mind subconsciously utilizes. Rubio and Perry could learn a thing or two from these guys, like don't count on canned answers, for one. Had they been comfortable within their respective platforms and spent their mental energy on thoroughly fleshing out their political positions, they wouldn't need to bank on recalling over-used speeches that have limited upside but large downside risk. Your brain can be wired to make rational decisions - not by being an intuitively rational thinking machine - but by trickery; use your brain's instinctive mental shortcuts to your advantage. The more rationality you constantly feed your brain (via books, education, etc. ), the more subconscious, rational decisions will be automatically made.